According to our plan on 4th April 2017 we conducted the LSA meeting at our new Godwari office. We collected the monthly report. At the same time we discussed about our new waiver and MOU. We also provided them with mark sheet to complete the report. We also provided them waiver and MoU. Our LSA have requested for games materials for all CLASS centers. 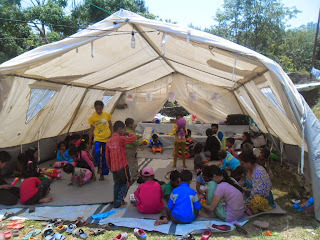 We provided games materials after the earthquake so if we provide game materials they can play.